Latitude: 30′ 20 mins south. Longitude: 153′ 6 mins east. 554 Kms (344 miles) north of Sydney and 427 Kms (265 miles) south of Brisbane. Coffs Harbour boasts the largest regional shopping centre in New South Wales. The population has grown enormously since 1990 with many residents arriving from colder climes to enjoy the region’s sub tropical splendour year round. The sub-tropical city of Coffs Harbour can be reached by car, air, bus or rail. 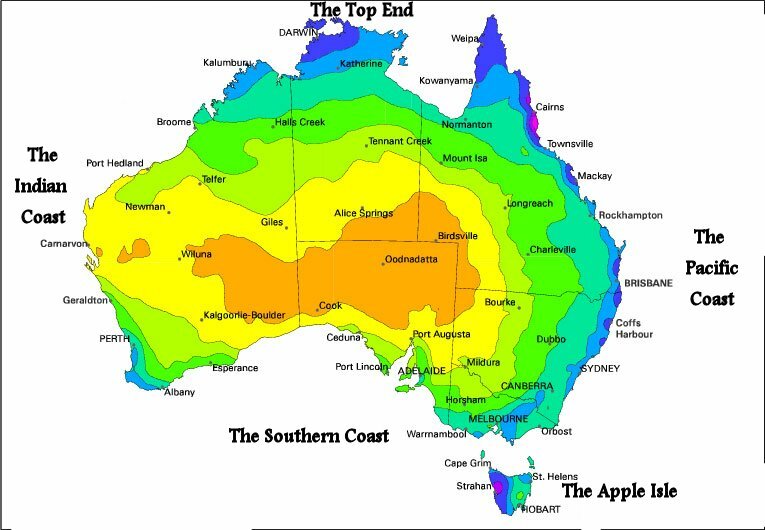 There are 44 kms (27 miles) of long, white beaches and the climate has been assessed as one of the best in Australia. The first settlers arrived in the 1840’s and bananas were introduced some 40 years later. Coffs Harbour is the centre for shopping: There’s the City Centre, Park Beach Plaza and Home Base as well as lots of smaller arcades and centres. In the hinterland you’ll find the Orara Valley, its secret dales lush with native trees, grasses, ferns and waterfalls. Australian native flora and fauna abounds. Twenty minutes north of Coffs Harbour lies Woolgoolga, an idyllic coastal village with one of the largest Indian populations in Australia. A short drive south along the coast will lead you to Sawtell and Toormina. Plan your own tour of Coffs Coast. Public transport can take you around town, south to Sawtell and Toormina, or north to Woolgoolga and Grafton. Jump on a bus and see where it goes! An unspoiled paradise of beaches and rainforest, Coffs Harbour was discovered around 1847 by John Korff who took shelter behind Mutton Bird Island during a fierce storm. He named it Korffs Harbour but the name was changed by the surveyor when the land around the harbour was reserved. Korff’s ship had been aiming for Bellinger River to load cedar. Cedar cutting had begun in Bellingen in 1841. The Forestry Commission took over the management of the forests in 1916 and by 1930 trade had all but collapsed due to lack of timber. When the timber business was at its height, 449 ships a year called at Coffs Harbour. The old Coffs Harbour jetty has undergone extensive repairs and re-opened to the public in October 1997. Many older residents can recall stepping on to that jetty at the tender age of 6. The pastime of Jetty Jumping has resumed and people of all ages are leaping into the ocean. In 1881, bananas were introduced to the area by Herman Rieck but there was no great market until 1914-18 when workers on the railway line and the breakwater provided a market because fresh fruit was hard to get. Coffs Harbour is the largest banana producing district in New South Wales and the north facing slopes are covered in banana trees. Banana growing is traditionally a family business. In the early days many banana growers were Italian and while the original families are still present, it is the Indian community of banana growers that is thriving. Woolgoolga has the highest concentration of Sikhs living in one small community in Australia. Bananas are mineral rich and are the ultimate fast food. They’re convenient, pre-wrapped and very nutritious. The original township of Coffs Harbour was the area now known as the Jetty Strip. It is home to a variety of restaurants – Seafood, Italian, Indian, Vietnamese, Mexican, Thai, European, Chinese. The City Centre was established once transport became easier. It was referred to as “Top Town”. In the late 80’s Top Town was transformed into a Mall but was re-opened to traffic in early December 2000. Only 6 kms south of Coffs Harbour lies sunny Sawtell and Toormina. Tree lined streets create a village atmosphere. There’s a fully restored cinema, shops, restaurants and cafes, club, sporting facilities and street markets. The Sawtell Toormina area has plenty of activities for holidaymakers. In addition to the beach, there’s a rock pool and sandy creeks for swimming. An 18 hole golf course, bowling green, croquet and 12 court tennis club. Sawtell village has become a mecca for good eating. Whether dining out of an evening or enjoying lunch on weekends, there’s a lot of award winning restaurants on offer. Every year in July the Sawtell Chilli Festival kicks in with a full day of hot delights. Highlights of the festival include the Chilli eating competition, and Chilli drinking competition. If you intend competing next year then you’d better get into training. The uninitiated at chilli eating should start with small doses and build up a tolerance to the heat. But beware, excessively hot peppers can cause jaloproctitis or perianal discomforture. Tucked away in the Coffs Harbour Hinterland is an area locals refer to as paradise. The Orara Valley encompasses the settlements of Red Hill, Karangi, Coramba, Friday Creek, Upper Orara, Nana Glen, Glenreagh, Ulong and Lowanna. Rolling green hills, lush rainforests and respite from the hectic coast. Good country pub food and a refreshing cold ale can be found at the Coramba Hotel and Glenreagh’s Golden Dog. An invigorating day out can be found at George’s Gold Mine. With views from the plateau back to the ocean, the old farm has plenty of picnic and barbeque spots. Join George for a tour of the old gold mine. In the smoko shed learn about the history while enjoying steak or sausage sandwiches, cups of tea and cake. Just 20 minutes north of Coffs Harbour is the seaside village locals call “Woopi” which has the highest concentration of Sikhs living in one small community in Australia. There’s lots of shops, places to eat, clubs, surf, rock and estuary fishing, patrolled beaches and shady picnic areas. Woolgoolga offers a range of accommodation to suit either the travelling businessman or the holidaying family. There’s two fully licensed clubs offering pokies and live entertainment.